Sacraparental has moved to a new location, and has a shiny new look. If you are getting this as an email, you are subscribed to the old site, but not the new one, so click here to head to the new one, and subscribe in the same way by popping your email address in the box at the top of the right-hand sidebar. Here’s the beginning of my newest post – click through to read the rest! 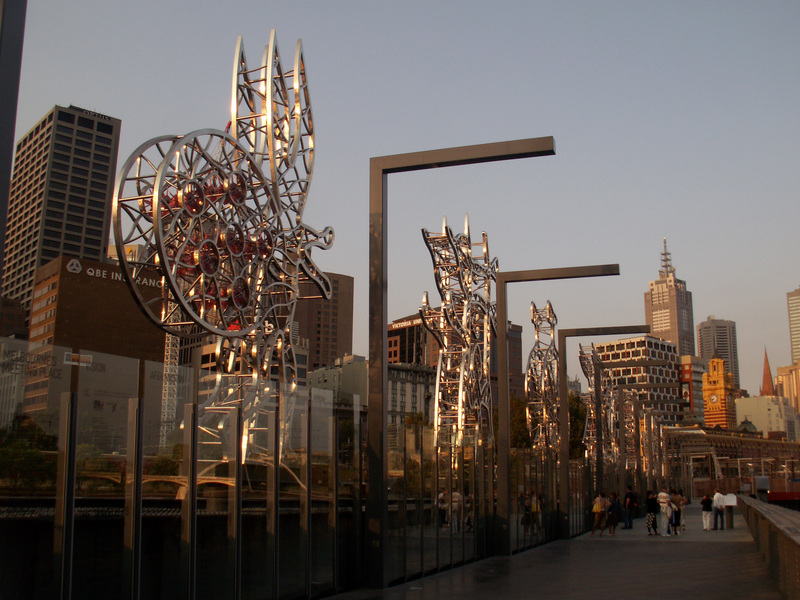 One of my very favourite places in Melbourne is Sandridge Bridge, home to the Travellers sculptural installation. Enormous steel figures fan out along the bridge (they used to move out at sunrise and in at sunset)representing the indigenous people, and then nine successive waves of migrants. The bridge also hosts 128 panels for Melbourne residents’ countries of origin from Afghanistan to Zimbabwe. The Running Couplerepresents the refugee era, the period beginning in 1956 when Australia signed the United Nations Convention on refugees. In contrast to this moving memorial to Australia’s history of welcoming people from all over the world, the Australian government is now so horrified at the thought of desperate people seeking sanctuary in Australia that ‘by hook or by crook‘ it turns away any who arrive by boat, breaching its international obligations. My own country is on the edge of falling into this moral cesspit too. In New Zealand we haven’t had any refugees arrive by boat this century, though the Prime Minister hints darkly that it is just a matter of time. Read more at the new site! « This is the old site. Want to find the new site? In terms of resettling rather than just letting people languish in camps, Australia pulls its weight fairly well. How many should we take in, and what do we do when n+1 persons shows up? With the former open doors policy that the labor party ran, we had ~1200 people (that we know of) drown coming by boat. Discouraging that dangerous journey is surely of some moral importance. There is a definite difference in attitude towards refugees coming to Australia (who are generally welcomed) compared to people who don’t follow what is perceived to be due process in how you come here.